Conjugal union has its origin in God, who in creating man made a person who needs to open to others, with a need to communicate and needs company. “It is not good for the man to be alone, let us make him a companion like him” (Gen 2:18). From the beginning of creation, when God creates the first couple, the union between them becomes a natural institution, with a permanent bond and total unity (Mt 19,6). So that it cannot be changed in its aims and its characteristics, since to do so would go against the very nature of the man. Marriage is not, therefore, an effect of chance or consequence of unconscious natural instincts. Marriage for the baptized is a sacrament that is united to the love of Christ his Church, which governs it is the model of the love that Jesus Christ has to his Church (cf. Eph 5: 25-32). There is only true marriage between the baptized when the sacrament is contracted. Civil marriage is contracted before civil authority. This marriage is not valid for Catholics, the only valid marriage between baptized is the sacramental contracted before a Priest or Deacon of the Church. – In order to celebrate the sacrament of marriage here at the Sanctuary of Guadalupe, it is important that the couple make an appointment with one of the priests or deacons to begin the marriage process. – Two witnesses for each contractor who can testify in favor of the preparation of the contractor to receive the sacrament of marriage. – Participate and complete the Pre-Cana, Pre-Matrimonial Class required by the Archdiocese of Chicago. 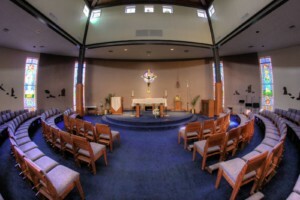 – The Sanctuary requires the suggested donation of $ 500.00 for the celebration of the Holy Mass. This must be paid in order to secure the date. Note: There is no date that can be insured until the quota is settled in its entirety. It is important to comply with all the requirements mentioned before the date of the celebration. For legal and ecclesiastical reasons, we can not celebrate the Sacrament of Marriage until all the requirements have been met.